Again at the end of my holiday I was in trouble. Nothing to read at all. Chick lit from the hotel library was the best I could find. I was dreading the flight home. How will I survive without a proper book. At the airport I found the last John Irving. Blind faith appears when I see his books, I had waited for the paperback to be published, otherwise I would have bought it earlier. Irving has a reputation for big books, yet this one beats them all. Way over 800 pages, I wish I had found the book 2 weeks earlier, it would have saved me having to buy some second rate books. I started on the plane and read until I couldn’t keep my eyes open. Back home the newspapers took over, but then I continued reading the story of Jack Burns. One could almost call this book his biography. He is being followed from his early days as a toddler until he meets middle age. In the first part we see Jack, age four, travel Europe with his mother, trying to find his father who had ran off without them. His mother, a tattoo artist, is convinced that once she gets to talk to him again, show him his son, they will soon after become a happy family. Obviously, this does never happen. 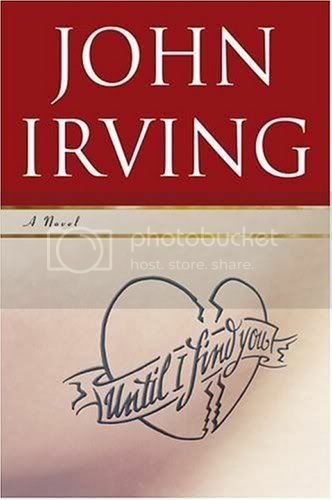 It wouldn’t be a John Irving book, more like a short novel by some youngster. Jack grows up and becomes an actor, specializing in transvestite roles with a tendency for relationships with older women. His view of the world has been developed through an education at a girls school, the relationships with his mother, his stepsister and the older women he ‘meets’ from the age of 12 onwards. The book was long, it took me a long time to read it (one chapter before going to sleep was the most I managed), but as always it was certainly worth it. Funny thing, imho, is that Irving, always good on research, has managed to slip a few IRL characters into his book, mixing with his fictional characters. I was, I am, will remain, a fan for life.